Sustainable agricultural intensification: Tackling food insecurity in a resource-scarce world – One Billion Hungry: Can We Feed the World? A new report from the Montpellier Panel, an eminent panel of international experts led by Sir Gordon Conway of Agriculture for Impact, provides innovative thinking and examples of how sustainable intensification can be used by smallholder African farmers to address the continent’s food and nutrition crisis. It defines sustainable intensification as “producing more outputs with more efficient use of all inputs on a durable basis, while reducing environmental damage and building resilience, natural capital and the flow of environmental services”. Sustainable Intensification: A New Paradigm for African Agriculture begins by examining the process and elements of intensification itself, before considering how we then ensure that the Intensification process is sustainable and can be scaled up by combining ecological, genetic and socio-economic approaches to intensification. Far from radical, promising examples of sustainable intensification are already being seen throughout Africa and are the brainchild of the very people who are at the frontline of food insecurity. For instance, some 200 million sub-Saharan Africans face serious water shortages. Among them are farmers living on the sun-baked soils of northwest Burkina Faso. They have pioneered a novel method of conserving water on their farms by digging medium-sized holes called zai (or water pockets) in rows across the fields during the dry season. Once each zai fills up with leaves, farmers add manure, which attracts termites during the dry months. The termites in turn create an extensive network of underground tunnels beneath the holes and bring up nutrients from the deeper soils. 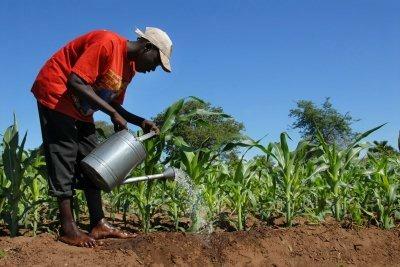 When the rainy season finally arrives, rainwater is captured in the zais which are sown with sorghum or millet seed. Farmers have consistently reported greatly increased yields using this technique. A key factor in the spread of zai adoption was the student-teacher system which sees those being trained in the process continuing to educate other farmers. If sustainable intensification is to meet both current and future food and resource needs, we will need to utilise existing methods, such as zai, as well as develop new game-changing technologies. One ongoing project, the Water Efficient Maize for Africa (WEMA) partnership, aims to develop some 15 new drought-tolerant maize varieties, which will be marketed royalty-free to smallholder farmers in Kenya, Mozambique, South Africa, Uganda and Tanzania. Developed through conventional breeding, marker-assisted selection and genetic engineering, the next phase of the project is developing maize varieties also resistant to pests such as stem borers, which may present even more of a barrier to increasing agricultural productivity in a changing climate. And sustainable Intensification isn’t limited to crops. Livestock breeders have long used cross-breeding to increase or intensify desirable traits such as milk or meat yields and suitability to local conditions. One such cross between the taurine cattle (Bos taurus), a high-yielding milk producer from temperate climes, and the humped zebu cattle (Bos indicus), native to the arid and semi-arid regions of Africa and Asia and highly suited to drought conditions, has combined adaptability and productivity successfully. Indeed in the Kilifi plantation near Mombasa in Kenya, a rotational crossing scheme alternating with bulls from the two breeds has resulted in Sahiwal x British Ayrshire crosses producing 3,000 kg of milk per year, mainly from pasture. Many who have criticised sustainable intensification have done so because of its highly technological focus. But under this new paradigm, the socio-economic factors that must underpin it are equally emphasised. Sustainable intensification will not be transformative without developing innovative and sustainable institutions on the farm, in the community and across regions and nations as a whole. Markets are key to reducing poverty. Only through improved access to markets can poor farmers increase their incomes and lift themselves and their families out of poverty. Yet, most poor farmers are not linked to markets. Smallholders, in particular, often have little contact with the market and hence a poor understanding of, and ability to react to, market forces. One answer lies in creating village-level ‘grain banks’, owned and run by a farmer association, for depositing their grain. The store is usually fumigated against pests, some grain is kept in case the owner needs it later in the year, and the rest is sold when prices seem right (rather than immediately after harvest when prices are typically at their lowest). In such a system in Kenya, the marketing depends on having a countrywide network of small and large markets. This network is supported by the Kenya Agricultural Commodity Exchange (KACE), a private-sector firm that provides farmers with prices and other market intelligence accessible to smallholders using a mobile phone SMS system. Despite promising results, many examples of sustainable intensification in Africa are small in scale and scope, and geographically isolated. What we need now is to link, combine and take to scale proven technologies, processes and systems, while investing in new solutions for the future. The challenges are complex, as are the technologies and processes required to find appropriate solutions. The paradigm of sustainable intensification shows a viable way forward in advancing the progress made towards the Millennium Development Goals and ushering in a new era of growth, resilience and development in sub-Saharan Africa. Lindiwe Majele Sibanda is chief executive of the Food, Agriculture and Natural Resources Policy Analysis Network (FANRPAN) and Katy Wilson is an associate with Agriculture for Impact (A4I). Now that you are ON-G don’t forget to log your clicks on our daily quick polls at http://www.onenameglobal.com. So many of you were doing this over the weekend that our boxes were overflowing with quick poll results! That’s what we like to see and encourage you all tto keep it up!